I have been on the road again for a week already, and even if I am not, time is flying. I spent the first couple of days travelling and I’ve noticed it feels so easy this time, partly because I am not cycling every day, and buses, trains and ferries cover the ground so much faster, but also because I trust everything to work out a little more than I used to. Friends along the way also make traveling life easier and more fun. 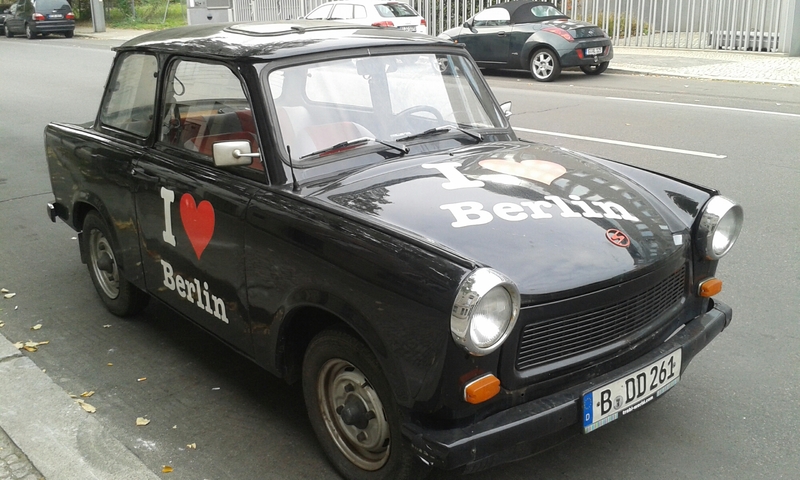 Jordi surprised me on Monday night by picking me up in a traditional Eastern Germany Trabi car with I♥Berlin painted in red and white on the front. It is definitely a car of character and charm, despite the thick smoke it sometimes coughed out. I am not really a city girl, mostly preferring to be in green spaces than urban jungles but it is hard not to like Berlin. It has the traditional and beautiful buildings of the past, impressive and dramatic, but Berlin’s more recent history provides a backdrop for raw honesty and it is not shy. If suffering gives rise to creativity then Berlin proves this. We visited an old airfield converted into a park with small community allotments growing fruit, flowers and vegetables in archways and flowerbeds built of recycled furniture. Old recycling bins had been upcycled themselves into seating and shelters and bits of wood, a steering wheel and an old iron made a giant plane for kids (and grown ups) to play on. Ann-Britt and I sat drinking coffee and eating cake outside a small cafe with blankets over our knees and around our shoulders while a man with long hair came to tell us a poem and sell us spirituality. Reality became even more surreal when another street seller came over and, whilst the abstract poem was still being recited, tried to sell us kitchen knives as he winked profusely. I saw the wall with all the graffiti, went to “The Devils Mountain” (a now wooded and very pretty hill made of all the rubbish from WW2) and climbed at Der Kegel. One evening we went to an event showing Syrian short films, in Arabic with English subtitles. Berlin seems to welcome everybody and I met so many people from so many places, it has been a great place to stay travelling again and I am leaving today a little more inspired than when I arrived. This entry was posted in Europe, Overland Travel and tagged Berlin, bus journeys, Culture, Europe, journey, overland, staying with friends, Travel. Bookmark the permalink.